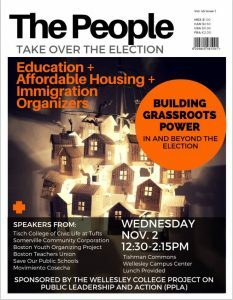 I’m speaking today at a Wellesley College event entitled “The People Take Over the Election: Building Grassroots Power in and Beyond the Election.” I think this will be my thesis: We must be organized to have power and to exercise it productively. Only when you are organized can you seriously ask the question, “What should we do?” Without an organization, you can still ask, “What should I do?” but none of us can do all that much alone. We end up combatting climate change by changing our own lightbulbs, or addressing racism by trying to improve our private thoughts. These are not pointless strategies, but they are badly insufficient. Without an organization, you can ask, “What should be done?” or “How should things be?” or “What should somebody else–often the government–do?” Those questions are too easy. (Carbon should be taxed; police should be overseen.) The hard part is figuring out how we can make those things happen. A habit of thinking only about what should be done encourages a spectator attitude toward politics. People without organizations end up being represented by famous individuals–celebrities–who claim to speak for them and who claim mandates on the basis of their popularity. Celebrities have no incentives to address social problems; they gain their fame from their purely critical stance. And they owe no actual accountability to their fans, since no one (not even a passionate fan) expects a celebrity to deliver anything concrete. Donald Trump is unusual in that he has moved from a literal celebrity to a presidential nominee; but he still acts like a celebrity, and presumably he will return to being a pure mouthpiece once the election is over. Meanwhile, back at the grassroots level, a person who feels represented by celebrities is unlikely to talk productively with fellow citizens who disagree. I mention Trump here because one important fact about his core constituency, White men without college degrees, is that they used to be organized, but that is no longer true. For instance, less than 6 percent of them are in unions. That’s an 80- or 90-percent decline* since the 1950s, and they are now less unionized than college grads are. Organizations build what Charles Tilly named WUNC: worthiness, unity, numbers, and commitment. For instance, the protesters now holding ground at Standing Rock are demonstrating that they have a right to be there (worthiness), that they stand together (unity), that there are a lot of them, with a lot of supporters around the world (numbers), and that they are willing to face violence (commitment). WUNC is a scarce but renewable asset for social movements. Poor and marginalized people all over the world have build WUNC and used it to change the world. It may be that we can do without older forms of organizations, such as unions, grassroots-based political parties, and religious congregations, now that we have digital networks. I think the jury is still out on that question. Loose, voluntary networks of activists brought down the Egyptian government, but once those networked activists confronted the organized Muslim Brotherhood, they lost the election, and once the Muslim Brotherhood confronted the even better organized Army, they lost a bloody struggle for survival. We need organizations during an election. It might appear that when it’s time to vote, each person can exercise power individually and privately. But that power is actually pretty trivial. Nate Silver currently gives Hillary Clinton a 99.8% chance of winning Massachusetts, which means that each vote here is close to irrelevant. What matters in an election is not your individual vote but your participation in organized efforts to change the whole discussion, the balance of power, and the outcome. Campaigns are such efforts. The Clinton campaign will spend more than half a billion dollars to build and run an organization. But modern presidential campaigns are problematic organizations because they rely so much on wealthy donors, they spend their cash so heavily on propaganda, and they establish short-lived transactional relationships with their own voters. But they are still organizations, and their power reinforces the importance of building other kinds of organizations as well. *not percentage-point, by the way.